Wherever chlorine is handled, a potential risk is involved and serious emergency may suddenly and unexpectedly occur. The most common emergency that occur during chlorine handling is leakage. Another possible severe emergency, that might occur, though rarely, is either due to fire or due to breakdown of valve or any puncture on the wall of the container. In case of fire, the chlorine container should be removed from the fire zone immediately to avoid any explosion. If the container cannot be moved and provided no chlorine is leaking therefrom, water can be applied on the outside of the container to cool the same. In case of breakdown of valve, or puncture on the wall of container, chlorine may come out as liquid depending up the position of puncture in the container. The first step to be taken in such a case is to ensure that only chlorine gas, instead of liquid escapes. This is because, the quantity of chlorine that escapes from gas leak is only about 1/15 th of what escape from a liquid leak through a hole of same size. The Container should be turned in such a way that only gas escapes. 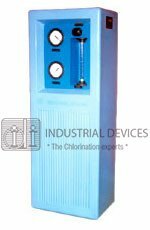 If the leak is extensive and heavy or liquid chlorine is leaking profusely, the situation is grave and can be dealt with only by a suitable absorption system. If possible, the container should be removed to an insolated spot where it will be least harmful. Leaks of chlorine can be easily detected by its pungent smell. 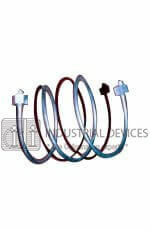 The exact point of leak can be ascertained by the ammonia method. Chlorine leak never gets corrected by itself. Water should not be used on chlorine leak. Ask all the persons to vacate from the affected area. Only trained persons, equipped with suitable gas masks and emergency kits should investigate the leaks and the cause for leaks. No persons should work alone on a chlorine leakage. If the leak occurs in equipment in which chlorine is being used, the supply of chlorine should be shut-off and chlorine should be disposed off. Leaks around the valve stem usually can be stopped by tightening the packing nut or gland. If this does not stop the leak, the container valve should be closed and chlorine which is under pressure in the outlet piping should be vented to the absorption system. 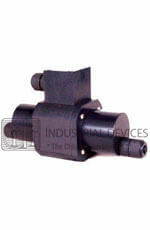 If the container valve does not shut-off tight, the outlet cap or plug should be applied. In case of a valve leak on a tonner, the tonner should be rolled so that the valves are in a vertical position with the leaking valve on top. If confronted with other container leaks, one or more of the following should be considered. If the container is leaking, turn it so that gas instead of liquid gas escapes (the quantity of chlorine that escapes from a gas leak is only one-fifteenth as compared to liquid leak through the same size of hole). Apply appropriate emergency kit device, if available. Call the chlorine manufacturer for emergency assistance. 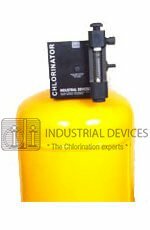 If practical, reduce the pressure in the container by removing chlorine gas to the process or absorption system. Know what to do in the event of any emergency. Be well versed with the location and use of personal protective equipment and in first aid for chlorine victims. Only responsible, trained personnel equipped with suitable respiratory protective devices should investigate or attempt to repair any chlorine leak. Chlorine leaks never get better, they always get worse unless they are corrected promptly. In case of Chlorine leak you should stand in the up wind direction, preferably on an elevated place as Chlorine gas settles to the ground. Never spray water or any other liquid on a leaking chlorine container for any purpose. Water may be used to cool non-leaking containers in a fire area, if the container cannot be moved. 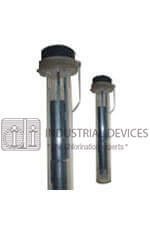 Never immerse leaking chlorine containers in alkali, water, or other liquids.